Have the fixtures been made for cship yet? Lads are saying that there are two rounds still down for April. That's only 3/4 weeks away. Anybody know dates or who playing who? All a bit ramshackle at the minute. KeshaWantsTimber wrote: Have the fixtures been made for cship yet? Lads are saying that there are two rounds still down for April. Does it really make any difference when it starts? You could play two rounds this weekend and it wouldn't impact the overall outcome. The championship in it's current format is a bit of a joke and needs to be changed but the clubs in their wisdom voted to keep it the way it is. Anyway, must people can pick for certain 3 teams that will come out of each group leaving a bit of a dog fight for the 4th place. The 4th placed team in each group then gets easily beaten in q/final. So, you'll have 2 quarter finals worth watching where the outcome will be unclear. Then two decent semi finals hopefully and an entertaining final. Out of 37 championship games (think that's right) only 5 will serve any real value for money all others will be at league pace. In fairness to Kesha, they (or someone they know) might like to plan something around the championship's April fixtures. I presume there is a County Board meeting on Tuesday. That might bring clarification. Did the meeting Tuesday bring about any progress on April fixtures? We’re not supposed to know these things, so keep schtum and don’t tell anyone. The hurling championship’s first round is scheduled to take place on the weekend on Sunday 10th April. My thanks to Birr GAA for tweeting that, because without that tweet I would be entirely in the dark regarding that fixture. Exact dates and venues have not yet been announced but with a round of Intermediate fixtures scheduled for that weekend too, I’d expect clubs with an Intermediate team will play their Senior fixtures on the Friday or Saturday. First round lineups are as follows – Coolderry v Shamrocks, Birr v Kinnitty, Tullamore v Clareen, Belmont v Shinrone, Kilcormac v Lusmagh and St Rynagh’s v Ballinamere. Bracknagh boy made a point here a month ago that the County board’s website hadn’t been updated in months. A month on and it still hasn’t been updated. I can see who the Offaly team managers were last year, and read the chairpersons and secretaries of last year’s sub-committees. There is no sign of the master fixtures list, and a diary of Offaly’s forthcoming league and championship games would be appropriate, as would a better promotion of the weekly lotto. If they're not going to use it then it should be pulled. Can anyone tell me why there isn't another round of senior club matches this weekend?? All six matches, I'm presuming, were played at league pace with no real desire from any team to set a mark. All results were pretty much as expected and no team is any worse really or better off. So really we're looking at teams training for 6mths for one meaningless championship game. Is it any wonder standards are below par in the county and the appetite for the game is lost. Another round of games this weekend may have had a bit more bite, I'm sure the county players would have welcomed a break away from the county scene to freshen it up. I can't understand how 2weeks wouldn't have been enough prep for 1st round against Westmeath since they've been together since November. 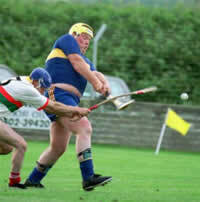 allstar2010 wrote: Can anyone tell me why there isn't another round of senior club matches this weekend?? All six matches, I'm presuming, were played at league pace with no real desire from any team to set a mark. All results were pretty much as expected and no team is any worse really or better off. So really we're looking at teams training for 6mths for one meaningless championship game. Is it any wonder standards are below par in the county and the appetite for the game is lost. Another round of games this weekend may have had a bit more bite, I'm sure the county players would have welcomed a break away from the county scene to freshen it up. I can't understand how 2weeks wouldn't have been enough prep for 1st round against Westmeath since they've been together since November. I think that it is most unfair to the many club players who have been training since February for just one round of the championship and an extended gap now of 13 weeks. A second round next weekend would have greatly helped our club players. It also appears that there will be only one round of the intermediate championship. With the hurling club structure currently in Offaly, many of our younger players will do their summer hurling in the USA. Why are we even discussing the format here? A committee was set up with there only objective to make a new format for the championship which would change the way it is now. The format that was chosen was less games for clubs which would of made more competive hurling which surely would of improved offaly hurling. BUT like everything in offaly it was voted against at the county board meeting...laughing stock!!! Yes greenairfield, the format is a joke and it's a real pity it wasn't changed. I think it's probably this format since about 2009? Way too many meaningless games. My question though was why no matches this weekend?? Could it possibly be due to the fact that if they got promoted in the football they would be in a division 3 final a week later. I believe that the Offaly hurling management requested this weekend for team bonding before they head into the round robin fixtures in two weeks, which in my opinion is only fair. I do agree it is a joke, one round in April in what can only be called horrendous conditions. Now can we blame the county board, yes and no!! Yes because, There shouldn't have been hurling championship until the round robin was over. No because, they put together a proposal where by there was 3 groups of 4 and no games until after Offaly where knocked out of championship. This was rejected by the clubs, so what do people want? I see there is a problem. But we cant have it both ways. Personally I think championship shouldn't start until July. We either copy the football structure and have a Senior B championship and 8 teams in A championship with 2 groups of 4 OR we have three groups of 4 with 3 ( 2 stronger and one weaker) with 3 teams from first two groups and 2 teams from third group making up the quarter finals. We need to get things better for the club player.. Yes Kaiserchief, in fairness we can't blame the CB for this. They knew change was needed and clubs out of pure ignorance rejected it. How is this format beneficial to anyone? Don't know about implementing a senior b competition. I'd be keen to go back to 3 groups of four with one so called weaker group. Top team in 2 "strong" group into semi and 2nd placed team into qf to play top 2 teams in group3. It seems the best format for a 12 team competition. Every game therefore is going to be competitive. Look at last weekends games for example. Kk v lusmagh, non event, kk won - so what, lusmagh lost - so what! Every game in championship should be a "must win". allstar2010 wrote: Yes Kaiserchief, in fairness we can't blame the CB for this. They knew change was needed and clubs out of pure ignorance rejected it. How is this format beneficial to anyone? Don't know about implementing a senior b competition. I'd be keen to go back to 3 groups of four with one so called weaker group. Top team in 2 "strong" group into semi and 2nd placed team into qf to play top 2 teams in group3. It seems the best format for a 12 team competition. Every game therefore is going to be competitive. Look at last weekends games for example. Kk v lusmagh, non event, kk won - so what, lusmagh lost - so what! Every game in championship should be a "must win". What you are proposing is blatantly unfair. Your system would see what in theory are the 5th to 8th strongest teams in the county not making the knockout stages, while the 9th and 10th would. If teams are getting thrashed then it shows we have too big a gap between the strongest and weakest, and therefore we should be following the example set by the football clubs who recognized the problem. What would be the problem with having three groups of 4 teams with no weak group?? Just an open draw. 2 group winners with best records straight into semis and 4 teams left play in 2 quarter finals. Two group winners who will go four weeks without a match (probably in late August / into September). Their semi-final opponents warm up with a quarter-final while they are marooned on the challenge match circuit. They only get five matches all year (they currently get eight). And how do you define the best records? If it's based on scoring difference (assuming the group-toppers all win their three group matches), the teams with the weakest clubs in their groups will go through to the semi-finals. The last time this system operated, Tullamore beat Birr in the group and still didn't reach the semi-finals. frankthetank wrote: What would be the problem with having three groups of 4 teams with no weak group?? Just an open draw.